Self catered ski holidays are a popular option for anyone who wants to ski for cheap and likes a holiday with lots of flexibility. 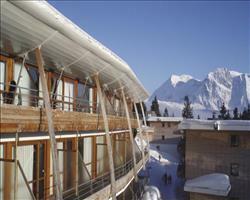 Most apartments can be found in Chamrousse 1750, like the Chamrousse Apartments. These have lots to offer – up amongst the trees most apartments are right next to a green run which allows even beginners to ski pretty much back to the door. Accommodation with doorstep skiing can make the whole week much less hassle – no lugging equipment to and from the slopes to wear you out before you’ve even skied them. Another useful thing to look out for when it comes to self-catering properties is proximity to the shops and restaurants, which makes the catering aspect of the holiday as easy as possible. Of course going self-catering doesn’t mean you spend the week tied to the stove! For a night off, good places to eat in 1750 include Le Chamroussien (in the heart of the village) where the owner Pascal serves up some mouthwatering mountain favourites and Chez Georges (by the shopping centre) which does a good mixture of local dishes, pizzas and sandwiches to eat in or take away. Although they’re primarily identified as budget-friendly, some of our apartments come with facilities generally associated with 4 and 5 star hotels like spas and swimming pools.